Once the material of science fiction, speech recognition software is now a matured technology which is extending the productivity of computer users worldwide. What can it do for you? How can you get started? Please read this brief review to learn more. What does speech recogntion software do? Convert your spoken word into text in any word processing application, text box, etc. Complete a series of computer actions with a single voice command using "advanced commands"
The most basic functionality simply requires that the program is running, that you activate your microphone and that you speak into the microphone while your cursor is located in a text entry window. Yes. Speech recognition is a matured technology that can easily provide accuracy levels in the 95-99% for most users almost right out of the box. But this having been said, speech recognition software isn't for everyone. In order to work well it requires that you speak into a microphone with attention to enunciating carefully. It also works best if you speak in phrases or complete sentences. For the "mumblers" and for the absolute "techno-phobes" it might not be the best solution. It requires a fair degree of discipline in its use and an environment which is at least reasonably quiet. While it will work in a loud environment with contaminating noise, this extra noise will compete with and mix with the sound coming from you and potentially reduce accuracy. But for anyone willing to speak carefully and spend just a little time getting to know the software and how it works, it is easy to obtain high levels of accuracy after the initial 5-10 minutes of training. So yes, it really does work, and works quite well for the person willing to put some attention into doing it right. There are several versions of Dragon, and you should carefully consider before making your purchase. Keep in mind that each version shares the same basic speech engine and it is only the available vocabularies and some extra functionality that differs from one version to another. 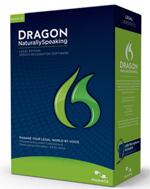 Dragon Premium: Although the most affordable version, we recommend this version only if your use of speech recognition is not "mission critical". Although this version is the least expensive and includes the same speech recognition engine used in all versions of Dragon, it allows only a single installation, does not allow for "roaming user" installations, and does not provide for building of advanced commands. To learn more about Dragon Premium, please visit our Dragon 12 Premium Page. Dragon Professional: This is the ideal version of Dragon software for anyone but the doctor or lawyer (special medical and legal versions are available). This version of Dragon includes almost everything but specialized vocabularies and integration with the PowerMic II microphone. It allows roaming user installation and creation of advanced commands. This is the version we recommend for most serious users of speech recognition, but many can get by with the Premium. To learn more about this version, please visit our Dragon 12 Professional Page. Dragon Legal: This version has all of the features of the professional version, but also an integrated legal vocabulary. For the attorney or paralegal, strongly consider the legal version, because of the integrated legal vocabulary, although depending upon the nature of your practice and legal terminology in your writing, you might also find the Professional or Premium version to be absolutely fine for you. For more information, please visit our Dragon Legal Page. Dragon Medical Practice Edition: For the doctor, associate provider, or nurse, this is the only version of Dragon to consider purchasing since it is the only version which includes a medical vocabulary and scores of sub-specialty vocabularies. It is the availability of these vocabularies that will hugely heighten transcription accuracy, as compared with non-medical versions. Beyond the vocabulary, the Medical Practice Edition has all the functionality of the Professional version plus the use of "Dragon templates" (which allow functionality of navigating through a note template while documenting) and also full integration with the PowerMic II microphone. For more information about the Dragon Medical Practice Edition, please visit our Dragon Medical Page. For some comparative information on the various versions, please explore the documents linked below. While the microphone that comes packaged with all new (full) versions of Dragon will provide reasonable results, for a number of reasons we suggest that you consider this a "proof of concept" or starter microphone. What's wrong with it? First, it's a $10 microphone and is neither sturdy nor particularly comfortable. Second, you get what you pay for and you are not paying for the best accuracy or external noise rejection. Keep in mind that "good quality" does not necessary mean ungodly expensive. We and others sell some specially microphones which are very expensive and depending upon your situation and finances such a product might be appropriate, for many users an upgrade to a microphone costing between $50 and $100 can lead to a cost effective improvement in quality. Simple upgrade from included microphone: Radio Shack "Sennheiser Knockoff"
Formal On-Site Training: Although the most expensive, this will clearly provide you with the quickest and most successful "jump-start". The usual scenario is an initial 2 hour or so one-on-one training session following by either an in-person or web-based follow-up a few weeks later. Speech Recognition Solutions works with several training partners in various locations in the US. For more information on formal training, please visit our training page. Web based training: Speech Recognition Solutions is proud to offer a comprehensive program of formal web-based training through a program called SpeechMax. This program is offered in 3 levels, depending up your needs, and provides initial training, ongoing product support, access to a KnowledgeBase and FAQ, and other features. To learn more, please visit our SpeechMax introductory page. Books and training materials: We offer purchase of a variety of training tools in the form of books, videos and workbooks. These materials are ideal for the individual with the time and interest to go through these assets in a slow and methodical manner. See these resources on our Training Videos and Books page. -1450, Inc. Dragon 10Video Training Videos: For a more in-depth video tutorial on Dragon and it's features, you can view this extensive series pertaining to Dragon 10. We are able to offer an updated version of this video series (directed at Dragon 12), but unfortunately at a substantial cost. Please contact us if you are interested in purchasing the current version course. Use formal Dragon correction techniques when recognition errors occur (rather than just typing over the error) so Dragon will learn. The best way is to enter words using the "View/Edit" functionality from the "Words" menu. Will Dragon work with an Apple computer? Mac users have several options. First, and simplest, you can purchase the Mac version of the Dragon software, called "Dragon Dictate". In our opinion this is not quite as developed as the Windows based product, but a whole lot better than the cloud based speech recognition built into the Mac OS. For more information about Mac Dictate, please visit our Apple Page. Other alternatives available to the Mac user involve running the Windows operating system and Windows Dragon software directly on your Intel-based Mac. This can be done "virtually" using Parallels or VMWare, or by setting up a separate Windows partition using Bootcamp. All of these methods require that you purchase a licensed Windows operating system, which runs over $100, and whatever version of Dragon you choose to run. Having used each of the methods, we consider the Bootcamp option the best way to run Dragon on a Mac, but it does not facilitate rapid transition from the Windows to Mac environment. For more information about using Dragon with a Mac, please visit our Mac Page.